We arrived in the afternoon and the first view of the renowned Lake Tekapo took our breaths away as the turquoise color promised to us peeked out so slightly to greet us as we climbed over the hill to enter the town. Magnificent. Just magnificent. I remembered I totally went OMG, OMG, OMG when I saw the view that greeted me. We headed straight to our hostel to check in before we make our rounds around town. We were greeted with friendly faces and helpful suggestions as to where to go to get the best out of the stay in this town. 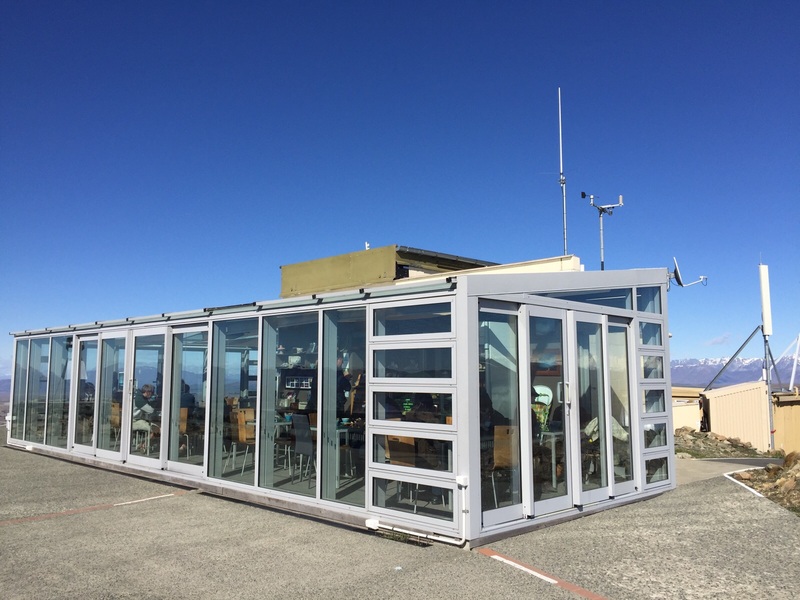 Naturally, the Astro Café is a big hit, almost everywhere that talks about Tekapo will point you in that direction. And so, we headed there. But the wind was so strong that the only road leading to the Café was close. We had to turn back and continue our exploration elsewhere. Delightfully, we found a hidden gem just along the road to the Astro Café and the views were just astonishing. After which we went around for a while before heading back to the hostel to get some rest before our night tour. The night was cold and we had our dinner before heading out. After the experience this afternoon with the road closure due to strong winds, we actually didn’t keep our hopes high. We reached the Earth and Sky office just down the road and the reception told us to wait a bit before they confirm the weather and register us, so we stuck around. Finally, good news was broadcasted and we queue up to register ourselves and got a jacket each. Mind you, we were already wearing ultra-thick jackets. But they said that the wind is still crazy up the mountain, so it’s best we don their “arctic jackets”. The drive was an adventure by itself. As to minimize the light pollution to the observatory, they would switch off their headlights while navigating through the winding mountain roads. I really have to salute the experienced driver for his balls and skills. Driving mountain range at night is one thing, but driving mountain range with headlights off is just insane. But he was quite right to say that once our eyes get used to the darkness, the moonlight is actually pretty bright. And so we finally arrived at the observatory after the thrilling ride to face our old enemy – Cold. The wind is really gushing strong and the path was dark, really dark. They did give us a small red light torch just in case we need some lighting up of the paths. Red lights are less polluting than white or yellow lights. There we learn about the stars we could see in the south. And the most amazing thing happened. We saw the southern lights. THE AURORA AUSTRALIS. Yes. 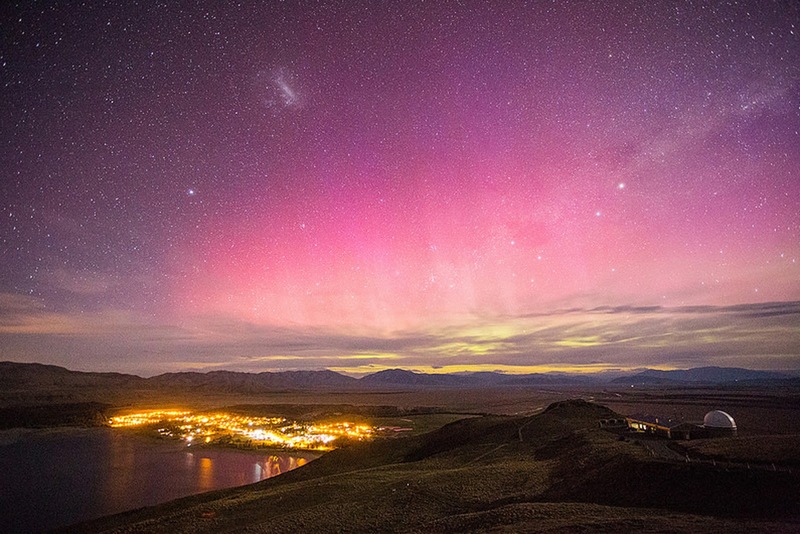 The legendary aurora australis. The dancing lights lit up the sky and it was the most beautiful thing we saw. Tips: don’t have to bring a tripod to the tour as the staffs are more than glad to help you take some amazing long exposure shots of the night sky. We finally went back down cold and tired but feeling amazing af. 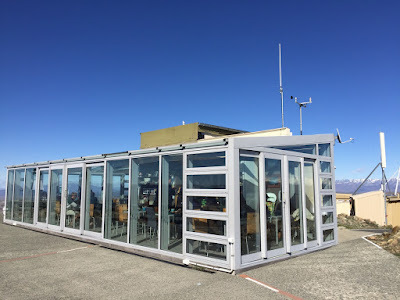 The next morning we headed over to the mountain range that leads to the Astro Café again and it’s open! We went ahead to have our breakfast and morning coffee up in the hills enjoying the cold breeze and amazing views before heading down to the Church of Good Shepherd again. It’s just too beautiful. After that we went to a recommended Japanese restaurant to fill our tummy before we move on. And there we ended our happenings in Tekapo and continued our adventure.